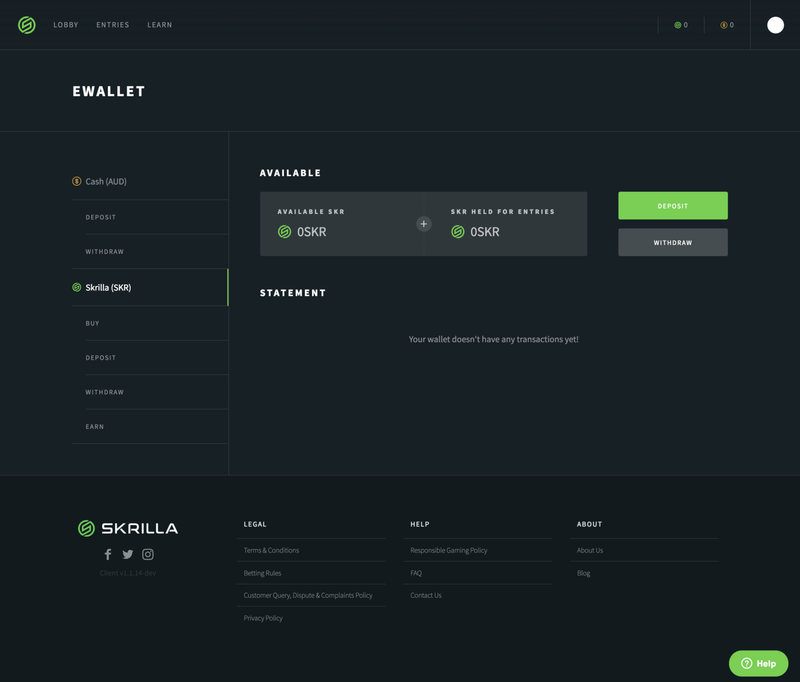 Skrilla is a licensed, fully regulated, global esports wagering brand. It is official, the Skrilla Token sale has now closed! The sale ended on November 20, 2017, 9pm UTC time. We would like to take this opportunity to thank everyone who participated in the sale, your support is most appreciated :) The Skrilla team is keen to focus in on the next phase and we look forward to having you join the Skrilla journey. What will the Growth Pool Tokens be used for? Skrilla will also run free to enter contests where the prize pools consist of SKR tokens to drive network growth. What will the Team Tokens be used for? Advisor Vesting — Advisors will vest 50% within 14 days of the close of the Sale, and the remaining 50% will vest over two years, with 1/24th vesting each month. Founder and Employee Vesting — Tokens allocated to Founders and Employees will vest over a minimum of two years, from the date of the allocation of their Tokens, with 1/24th vesting each month. When we first set up the token structure, the intention was that Team tokens would represent 10% of the total supply. At the close of the Sale, the Team tokens now represent 24.6% of the total token supply. We recognise that 24.6% is a lot of Team tokens! As a result we have committed to redistribute 14.6% of the total token supply from the Team token allocation to a network reserve, with the intention that they may be sold to strategic backers we are in discussions with. This will further fund the ongoing development and scaling of the project, for the benefit of the community. We will keep you up to date on this as it progresses. Now the token sale is done, what can you expect next? The SKR token has already been listed on EtherDelta. It will be possible to trade SKR on EtherDelta from December 4 onwards. In creating the Skrilla Token smart contract, we applied a 14 day period lockup period from November 20 (the token sale close date) to December 4, during which time it is not possible to transfer the token. After the 14 day period ends, the purchased Skrilla Tokens can be accessed and traded by token holders. We will provide further instructions tomorrow regarding withdrawing your SKR tokens to MEW tomorrow. We are working towards getting listed on at least one mid tier cryptocurrency exchange in the near future. Getting listed on another exchange is a high priority. We will keep everyone up to date with progress. We are partnered with SportsRadar, who provide our historical and live in game data for our esports daily fantasy contests. SportsRadar are a reputable operator with years of experience, and work with several large sports daily fantasy and betting clients globally. Right now we are fine tuning our esports data, in anticipation of scaling our audience in Q1 2018, so we can provide the best possible customer experience. We currently offer CS:GO daily fantasy contests. We have been hard at work on League of Legends (LoL), and the release is imminent. Following on from LoL, we will look to roll out Dota2. We are excited to be integrating the Skrilla Token into the platform in December. We recognise that to provide value to the Skrilla network and to the token holders, uptake of the token within the Skrilla platform is essential. Our desire is to make SKR the core unit of exchange within the platform. This means users will utilise SKR to enter daily fantasy contests and to receive winnings. However, there is work to do around crypto education for any new userbase, as well as restraints around blockchain infrastructure that will present friction for any consumer facing product in this space. We will be working hard to iterate and solve those challenges on the journey to achieving token / utility fit over the coming months. Our US lawyers have been working diligently to prepare the relevant documentation to assist with the launch of Skrilla in the US. We are targeting a soft launch for US beta testers in December. Initially we will roll out a sweepstakes model (free-to-play) into all 50 states, with pay-to-play following in the states where it is legally viable. Currently there are 16 states which have officially regulated DSF, 9 states have ruled against DFS, and the remaining states have issued no ruling as yet. We will look to enter the States which have no regulatory requirements as a first step towards pay to play, whilst proceeding to obtain licenses for key states. We are in the process of submitting DFS applications with key states. During the token sale we ran a bounty campaign through BitcoinTalk. Please be advised the bounty campaign has now officially closed. For those who participated, please add your MyEtherWallet address in the Bitcointalk thread. The tracker sheet will be updated in the coming days and we will begin to distribute the tokens in the week post December 4. Thank you to all the bounty hunters who participated and helped us spread the Skrilla word. Please join our Discord and or Telegram to get amongst the Skrilla community conversation!